4219 Emory Avenue | SOLD in West University Place, TX! 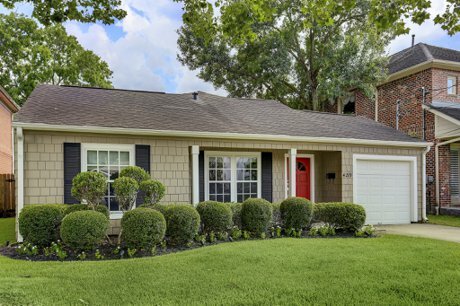 4219 Emory Avenue is a updated West University Place home with two bedrooms and two full baths. This home was completely rebuilt from the studs in 2003, and has features such as vaulted ceilings, hardwood and travertine floors, an open floor plan, a huge master suite with a vaulted ceiling, and more! Fully rebuilt and remodeled in 2003. Flagstone walkway leading to front door. Exterior is low-maintenance Hardiplank. Formal living room by entry has gleaming oak hardwoods, crown moldings, recessed lighting, low-e windows, and netural colors. Double French doors off of the formal living room lead to the study/secondary bedroom. Generous double-door closet. Hall bath with granite counters, glass shower, and stone tile floors. Kitchen features plentiful cabinets, double stainless sink, Kitchenade stainless steel refrigerator, stainless KitchenAid vent hood, and a KitchenAid Superba 4-burner gas stove and oven, bull-nose granite counters. Sliding door leads to utility area, with stacking washer/dryer which remaing with the house. Refrigerator remains as well. Open to living and dining area. Large, spacious living/dining space with breakfast bar overlooking kitchen, recessed lighting. French doors lead into the backyard. Master bedroom suite with vaulted ceiling, recessed art lighting, hardwood floors, and private double French doors leading into the back yard. Master bath with granite counters, limestone floors, a soaking tub, plentiful storage, and a separate glass-walled shower. Huge walk-in master closets with California Closet design and attic access for additional storage. Fully-fenced yard with sprinkler system and "up" lighting int he trees. Flagstone walkway leads to a floating patio topped with a pergola. The pergola features exterior lighting, a cooling fan, and a fountain. Great West University Place location with easy access to downtown Houston, the Galleria, and the Texas Medical Center.